A certainly effective way to catch their eye, this large, impossible-to-miss photomural will communicate your important message to everyone that walks by. Simply provide your print-ready graphics according to the Artwork documents below. 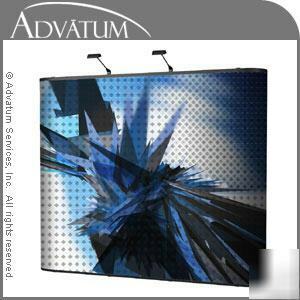 This display system is the strongest, most durable available on the market today. The patented lightweight frame expands easily, securely locking for a stable, professional-looking backdrop with no buckling. Your artwork will be printed onto the world's most durable film base available, in sharp resolution and vibrant colors. Quality lamination ensure graphics remain scratch-free and vivid, even after many years of frequent use. We exclusively sell online, partnering directly with quality U.S. manufacturers. This means high volume, low overhead, unmatched product satisfaction, allowing for prices far less than what you would pay through a regular dealer. Many vendors claim to sell the â€˜bestâ€™ quality display systems, and even offer similar warranties. To truly find the highest value for your budget, learn what you can about the construction and design of the system and avoid the common pitfall of costly replacements. Click here for a list of questions you should ask when shopping for a pop up system. This system is the result of years of careful improvement and engineering, producing an industry leader of pop up booths designed to meet your needs for years to come. With a seamlessly self-aligning panel system, brilliant lighting, abrasion resistant materials, and endless possible configurations; be confident in your booth presentation. Unique for its incredible load-bearing strength, the frame will support a variety of accessories without buckling, remaining perfectly stable. Frame materials allow for the highest strength to weight ratio possible, making for a remarkably lightweight system thatâ€™s easy to transport between shows. Tradeshows have many booths competing to attract attention, so you must set yourself apart for your message to be heard. An eye-catching exhibit that complements your business is a great way to make a clear lasting impression. Orders purchased after 3PM EST will be processed the next business day. Other countries please contact for quote. Printed graphics cannot be returned. With this system you will receive a limited lifetime warranty from the manufacturer, guaranteeing you against any faults or defects. Click here to read the full warranty statement. Please contact us if you have any questions. Copyright © 2007 Advatum Services, Inc. All Rights Reserved.